Golden is the garden, golden is the glen. Golden, golden, golden, October’s here again. Golden are the tree-tops, Golden is the sky. Golden, golden, golden, October’s passing by. Teachers will touch in with you regarding their schedule availability to meet regarding your child’s progress either during the break or the days that follow. These conferences are a wonderful opportunity to get a sense of your child’s role in the class community as well. Please join us for our first annual DANCE party fundraiser! This year’s theme is Arabian Nights – featuring a delicious Middle Eastern / Mediterranean vegetarian farm to table buffet, adult libations aplenty, henna art and a few surprises too! Dress up if you’d like…themed costumes welcome! Feel free to invite your friends by emailing the link above! All ages welcome, please tell a friend as this event is also an open house and a great opportunity to learn more about the curriculum. Bread baking and a puppet story round out the morning for littles ones as well. 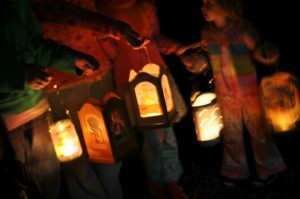 We will meet by the playground and then do our beach walk complete with lanterns made lovingly by our dear children (in class). The children will sing songs, and enjoy the stillness of the beach at night. As this is a reverent event, please do not allow your child to run the beach. Parents are responsible for supervising their children during this event. We are so grateful for all of the time and care so many have taken already this year, for the betterment of our community. Thank you so much to the Green Family, Geoff Pierce, the Benoit Family and John Schroeder for installing our new floors! Thank you again, to Geoff Pierce for donating and installing our new basketball pole system! The kids LOVE being able to play again! Thank you to all who helped bring together our first festival of the year on the equinox – The Benoit Family, Keshara Alleyne, Chris Maute, Natalie Maute, Tiffany and Gary Blackden, as well as all of the parents, grandparents and friends who came together for the morning – the pictures say it all! The trials for the brave and courageous! Preparing the set for the Equinox play. Many students attempted the challenges! 3rd/4th planting romaine lettuce in the garden. Thank you so much to Kai Green, Jessica Bromby, Keshara Alleyne, Yolanda Benoit and Jasen Benoit for taming and maintaining our garden! It is a big job, and we so appreciate all you have done so the children are able to enjoy all the benefits of learning how to garden organically, get their hands dirty, do some hard work, and harvest their bounty for our community lunches. Thank you so much to all of the students who helped with our Hurricane Irma clean up – from our first grade, through Saltmeadow school, many hands made for light work, especially when it came to big branches! Thank you also to Chris and Natalie Maute for their assistance, and to Geoff Pierce for all of the repair work needed outside. Branch clean up by 3/4th and 5/6th. Love the can do attitude in 5/6th! Repairing shade sails. Thank you to our yard sale team – Yolanda Benoit, Rita Radi, Keshara Alleyne, Natalie Maute, Jasen Benoit, Jennifer Suter, our 3/4th grade, and our 5/6th grade for setting up, managing and disassembling our sale, and of course to all of you who donated to the cause! A huge thank you to the Chawkins family and Symphony Salvage for hauling off and purchasing all leftovers! What a huge help! Some of our early childhood students celebrating the fall season with their annual trip to Fruitville Grove. Older ones assist the younger ones in the mixed aged group. The Nursery and Kindergarten are combined this year full time and we have been reveling in the benefits of this union. The Kindergartners have been enjoying helping the younger children and setting a fine example. The Nursery children have appreciated having older children to play with, who show them things and help convey a sense of security in the classroom. This group approach helps to establish a community feeling for all. The class rhythm works smoother and everyone feels that their opinion and ideas are important. We started out the year with a focus on the Fall Equinox festival. The children made dragon bread and created dragons with fiery breath using crepe paper. Our circle was about a knight that defeats a dragon and the story was from Tiptoes Lightly. Tiptoes Lightly is a fairy and her friend Jeremy Mouse witness the taming of the dragon in the story. This time of the year, when the outer light gets dimmer, we can look inside ourselves for our own inner light. We can look at our own dragons and work to tame them to become better human beings. We read these stories to the children as a fun activity but even for the youngest children this translates as being able to accomplish something they haven’t been able to do before. The children feel a sense of accomplishment and support from their teacher’s and school friends. Making dragon bread in the kindergarten. We have celebrated three birthdays already, with candles, a puppet play and many gifts from nature. A child’s birthday is a reverent experience in the class. The other children get a chance to focus on their friends special day and serve them with their special hand made presents. This helps the children to feel empathy and care for others. Recently, we visited Fruitville Grove for our Fall outing. We visited and fed the goats corn, took a hayride and explored the Grove, its various farm animals and playground. Each child took a small pumpkin home as well. Feeding the goats at Fruitville Grove. Our current circle is about Squirrel Nutkin and a few lively Halloween songs. The circle is a wonderful way to help the child with memory, manners, being in a group, and gross and fine motor coordination. Some of the children have been sewing gnomes, hearts and a star. They also have been introduced to twisty twirly. This is the beginning of handwork in the Kindergarten. Handwork in the Early Childhood is a wonderful way for children to work on their fine motor coordination, focus, concentration, will to complete a task, and use their imaginations to create a toy or gift for their family. The Nursery and Kindergarten have also delighted in their new weekly Forest Friday outings. We have gone to both Crowley Nature Preserve and Phillippi Creek for outdoor immersion and discovery. Exploring in the woods at the Phillippi. The benefits of all of this outdoor time is very important for the children. They develop a healthy respect for nature and a wonder about all that’s around them. They find so many interesting and exciting items in nature to ponder and ask questions about. Being out in nature also has an overall positive effect on a child’s well being. As Halloween approaches, we have pumpkin carving, wet felting and sewing projects to look forward to! Discoveries. The first graders have been exploring many new experiences, in and out of the classroom. Can they hear their teacher calling them into join their classmates? Can they walk in a straight line, or follow as the line curves and turns? Can they be ready to see who’s day it is to light the candle? Can they say the verse all together? Can they find their voice to join the morning song? Can they respond to the attendance call? Can they listen to the story being told? Can they find their crayons and their book and be ready to work? Can they shut their desk so quietly? Can they find their next page in their book? Can they try their best to draw a straight line, a curved line following the teacher’s drawing? Can they roll their crayons, tie a bow and put their things away? Can they be ready, with their cloth down and their snack or lunch upon it, waiting quietly for all their classmates to sing the blessing song together? Can they pack up their things, wash their desk and be ready for recess? Can they play with friends, work out the disagreements, or find a teacher for help? Can they make a slip knot, or many slip knots on their string? Can they measure and saw the wood to help make their knitting needles? Can they find the color for their painting? Can they warm their hands to model their beeswax? Can they listen when a new teacher comes to share? How can they remember so many experiences? Discoveries. It’s what first grade is all about. The joy of the first grader! The children have brought an increased sense of confidence with them into second grade. They have a new and exciting perspective on their school days and meet it with bold strides. They are beginning to become more independent, questioning everyone and everything around them. As we build on the foundation from first grade, the children experience the gentle, kind, empathetic qualities in the stories of the saints, and from fable stories, the tricks of the wily fox, thus reflecting the ever contrasting polarities that they too are seeing in their lives. They are ready to be challenged with more difficult arithmetic problems, paintings with several colors, adding purling to their knitting projects, learning new drawing techniques, printing evenly and precisely, beginning to read their work, modeling more complex beeswax figures, singing in rounds and playing their flutes. They are also confronted with what is often the most difficult trial of all: experiencing differences among their classmates and choosing to call upon their kind heart to work it out, be a friend to all and show forgiveness. The second graders have stepped forward on their journey this year with a joyful spring in their step and are experiencing their new challenges in the special way only a second grader can. Field work in 3/4th grade. After embracing the strong winds of Irma, the third/fourth grade has delved deeply into the building our class community, returning to the rhythm of school, and into getting to better know where we live. sitspot (x marked the spot). The success brought excitement and new appreciation for their budding cartography skills. Next we turned our attention to representing our classroom from a bird’s eye view. This allowed us to begin to consider how objects are oriented in space and how to represent them on paper. Some students naturally wished to draw exact details of objects on tables, and others were content with rectangles and squares. We noted that some students drew smaller objects quite large, and large objects quite small. Our desire to represent objects proportional to their actual size was born. This desire carried over to the first maps of our school campus. After discussing ways of measuring small and large distances, we set out determined to create a map of the campus that accurately represented the buildings, gardens, vernal pools and playspaces. We measured the length of Ridgewood Street by counting our steps. Inside, we measured our strides and then calculated how long Ridgewood was for each of us. Our measurements ranged from 644 feet to just shy of 1,000 feet. Amused, we brainstormed ways that would be efficient (not measuring with rulers) and accurate. A trundle wheel was mentioned, and Max volunteered on of his father’s (Thanks Gary!). We proceeded to measure each road, building, garden, pool, playground, the distance between our sitspots, sidewalks, and even how long spilled water traveled on the sidewalk. With all of these measurements, we set off to create maps in our main lesson books. But still lingering was the question of how to represent everything proportionally. We learned about scale, and it was suggested that we use the scale of one inch equals one hundred feet. Calling on one of the many purposes of decimals, we used moving the decimal two place values to the left to transform feet into in inches. Aided by lightly drawing a grid of one inch squares, each child created a clear and accurate map of their school campus. Other lessons on cardinal directions, symbols, keys, and so on were embedded throughout the creation of these maps. We moved on to widen our definition of community by investigating our neighborhood, and then our routes to school. Children viewed a map of Sarasota County, taking delight in finding major landmarks. Many found the roads they live on, and still others found the three roads that surround our school campus. Next we will uncover the watershed of which Mangrove School is a part. We’ll follow the water and elements as we learn about the land that drew each of us to live with at this moment in history. The children will continue to expand their map making skills, echoing the cartographers of all time, mapping the world as we continue to find our place here. This will lead us to investigating the early inhabitants of Sarasota Bay, all the way up to current personalities. All along the way we will pay close attention to how the local habitats affect humans and humans impact their habitat. We will seek to uncover what this land asks humans to do here in this unique ecosystem. Making connections in Music Theory class. I appreciate all of your dedication to your children. They certainly stand out as some of the most empathetic and kind children with whom I have spent time with. I look forward to continuing on our learning journey together! Once again we began the year with torrential storms, however in the 5th/6th grade classroom, we have enjoyed relative harmony as we set off on an odyssey of sorts, with many points of interest around the world, now venturing further, into the earth, and into the sky for these curious, kind, funny, wild and always interesting human beings. In geography, our perspective widens this year, as our studies encompass a much larger span – beginning with the continent of North America. We were first introduced to the whole, looking at the basic geographical features of the continent, how the land changes as we travel in various directions, and discussed the contrasting ecosystems. Included in this introduction, we looked at the interplay of climate, altitude, soil, flora and fauna, and how they generally impact the possibility of exploration and settlement. Recalling Florida heritage at Crowley. We very briefly reviewed our local studies from last year, when we focused on our immediate surroundings, which then radiated out, into the city of Sarasota and the state of Florida. From here we explored what we divided into ecoregions: The entire Gulf Coast, focusing on the bodies of water, and how they influenced settlement, which we then followed up the eastern seaboard – the South Atlantic Coastal Plain and Piedmont, including the fall line cities, and the role of the plantations, then New England, and the Canadian Maritime provinces. Here we discussed the role of the Atlantic Ocean, fishing, exploration, the colonies, and whaling. Next we went to the the North Atlantic States, through the Erie Canal and its role in the expansion into the Northwest and the impact its creation had on the state of New York. Most recently we looked at the formation of the Great Lakes region, its natural resources, as well as its later development as a major center of industry, contributions to agricultural technology, transportation, and architecture. With each place we find an overall gesture – the independent impulse of New England, and the industriousness of the Great Lakes, for example. Regional cooking to deepen our geography studies. We make it an immersive experience by incorporating regional literature, songs, Native American legends, and dance. They cook and experience the taste of indigenous foods. They read books that not only take place in, but richly describe of the areas we have studied, such as Misty of Chincoteague, Seabird, Rascal, and more. At the same time, they are being exposed to excellent descriptive writing that exemplify how words can be used to give us a vivid picture of our surroundings in various time periods. Carefully drawn student maps help orient them in space. In our current veil painting, mountains are slowly rising above the plain. Studying geography in this way, is not only interdisciplinary, it is much more meaningful. The students are also so very social and love to share, so recalling their own experiences in different areas, and reconnecting to those areas with a fresh perspective has been exciting for them. Rather than memorizing the state capitols and other random facts of each state; we imbue the children with the crucial aspects that have been a driving force in a particular land’s development, and they gain a greater comprehension of how the world works. We weave in many relevant subjects – botany, mineralogy, economics, and more, so they get a sense of how these affect one another. Then throughout the year we can continue to recapitulate these ideas from several angles, helping them to understand the larger picture. The subject of geography has the capacity to truly unite the child to the earth as they become familiar with how an area came to be – how the land and water shaped the earliest humans and later settlers, how they in turn shaped their environment, as well as how it all fits together with neighboring regions. The sense of belonging to their local surroundings that was solidified last year becomes much broader, moving them closer to being a true citizen of the world, as they also gain a feeling of brotherhood between our neighboring nations (even deeper with our weekly language classes of Spanish and French), which seems crucial given today’s political climate. Crystals grown on seashells in Mineralogy. We have also begun our first science block, in our study of mineralogy, drawing attention into the depths of the earth, where we will discover polarities in minerals, their optimal conditions, and their contrasting creation. We began the block with a discussion of and examination of various types of rocks from all over the continent, and discussion of what types of clues rocks can tell us where we find them. Then from the whole, we move to the parts – the minerals that make up rocks, and elements that make up the minerals. We looked at two minerals that seem to be complete contradictions – dark, soft, dull graphite, and a brilliant, clear, hard diamond. The students were amazed when they discovered both minerals are simply the element carbon, and their extreme difference is based only on the bonds of the molecules; the very loose bonds in graphite allow us to use it daily for rubbing on paper, whereas the very tight bonds of the diamond allow it to be hard enough to scratch any other mineral. We grouped minerals based on common mineral classes, such as silicates, carbonates, and more, and were able to find many examples we already knew, such as quartz, clay, limestone, and salt, as well as how to identify minerals in nature. We also examined some less common minerals and tried to guess what they had been used for historically, such as optical calcite, a double refracting clear mineral, once used by Vikings for navigating. We then used our powers of observation to describe various minerals – carefully recording color, luster, hardness on the Mohs scale, streak color for example. Most recently the students have begun some experiments to see how minerals form their crystal structure, as well as how temperature can influence the structure. Using common household minerals – epsom salt and borax, students grew their own crystals, and were able to see the optimal conditions for growth for each. Looking ahead we will now be moving onto the rocks the minerals come together to make, and delve more deeply into the clues they give us about the earth and its history. In the first week of school we also revisited the circle, the shape we have done freehand for years in form drawing and then later in freehand geometric drawing, all the while honing our ability to connect our hand, brain and eye in search of perfection. Now that it was time to introduce an instrument to create this, the compass, we naturally recapitulated its origin, at the sand with various materials trying to figure out all the ways we could make the most perfect circle, which they figured out right away – a stick and a rope, creating a compass of sorts. Then we did this again in the classroom, with pencils and string. Then finally the students were presented with their compass, and they were elated. After years of trying to sneak cups or jars around the room to trace, they can finally make perfect circles! After some basic instruction on compasses, we began our first geometric drawings, all of which will be constructed within a circle. Each one is done twice, the first time we learn the form, the second time we learn from our previous mistakes! So far they have completed Six-fold Symmetry, Six-fold Symmetry II, and the much more arduous Five-fold Symmetry. Learning to use their compasses. Great stress is laid on careful, precise, accurate drawings. This subject is one that unites the class; they all put a great deal of effort into the process and the finished product, working meticulously, and helping each other as they go. They were incredibly excited to show all of you parents their new found capacity at our parent meeting as well. The students become the teachers, in recognition of their desire to stand on their own. Along the way we have continuously engaged in math review, from place value to decimals, measurement to fractions, taking nothing for granted, as well as placed a special emphasis on mental math each morning. We have also began creating an almanac of sorts, recording the weather, sunrise and sunset times, which we will then graph. This practice also brings more consciousness to the seasons and cycles of the year, length of day, the equinox and solstice. In the coming week we will review practical applications of geometry. The students have also begun their practice of the ukulele this year, kicked off with a trip to the Rhythm Inlet in Nokomis, to learn the history of the instrument, which was first made in Hawaii by Portuguese immigrants who worked the sugar fields, and is based on the native Portuguese braguinha. After becoming familiar with the instrument, again recognizing growing independence, they are learning to tune their instruments on their own, and are currently learning simple songs that use two chords. With each step they find success and the encouragement to keep practicing. Woodworking has also been a source of motivation for the 5/6th grade, and is an effective way to get them to focus externally, rather than at the internal drama that is bound to bubble up at this age. It also fosters self-discipline, self-awareness, and the will to create something functional as well as beautiful. So far they have have learned the different types of wood, how to choose the appropriate sandpaper, made their own twig pencils, and wood stampers. On our Forest Days our focused class time activities have reflected the students’ ever expanding capacities – identification and recording of various vegetation and animal tracks, mineral specimen collection, creating a sundial, and orienteering. At other times, they are simply savoring their connection with the woods, being free, climbing, exploring and building forts. This week they were delighted to see three bluebirds at Crowley, a first hand observation of the impact of their service from last year’s blue bird house building and installation. Singing, meditation, fine arts, handwork (sock knitting) and verse recitation are just a few of their other activities. Class meetings help address the occasional yet inevitable social dissonance of the age, fostering healthy communication, empathy, and accountability to one another and the group as a whole. Although many faces are the same I am always struck when I meet a brand new class each year, with new capacities, interests, and proclivities. It is inspiring to see them come together again, like a family – sometimes squabbling, but always caring for each other, even if in subtle ways. I am beginning to see elements of conformity common of the age – wearing the same outfit to school, coordinating Halloween costumes, as well as the very obvious priority of their social life, and a frequent, very pronounced division between the boys and girls, which lends itself to playful mischief and pranks of all kinds. Thank you dear parents for your continued support as we take a journey of a different kind – into the tumultuous waters of pre-adolescence! Also, a reminder that our caving trip will be on Saturday, November 18th. I will be in touch with more detailed logistics soon. For all grades the beginning of the year is a lot of review. They are recalling what they learned last year, and as there are new students, it is an opportunity to help each other remember the various words, pronunciations and very basics of the french language. Greeting each other in french, saying thank you, please and saying goodbye . Word challenge for the year; spelling. 1st week- Introductions- we went around room and each student would say phrases like… hola! mi llamo _____ . Me encanta ______, then personalize it with their favorite things. We ended class with a review from last year with the fun game of Simon Dice, especially to review body parts and verbs. 2nd week- I cut out different colored squares to play a color/pattern game with students. I would call out different color patterns in Spanish, like azul, rosa, azul, morado, azul rosa, azul morado …… and they would hop from one square to another calling out the color name in Spanish and trying to remember the exact pattern. Started with simple patterns then would make them a little more difficult. With 5/6th I had them put a finish goal in middle and separated them into four groups where they would ‘race’ towards middle remembering the pattern and hopping from color to color. with the 3rd/4th I had them just go in a line and make a pattern recognition train. 3rd week- Cultural Day- The beginning of Hispanic Heritage Month. We began class with a little show & tell and discussion of HHM and why it came to be. I brought some special artesanias from Mexico that I got from my travels and from my grandmother who used to help las Tarahumara Indians from Chihuahua, Mexico (where I am from) sell their wonderful textiles and artesanias. So they got to see and feel first hand some of these specials things made by las Tarahumaras. Since Mexico was in the spotlight during this class, and I had brought an special copper armband that I got on a solidified volcano that is dedicated to the Virgin Mary on the day of the Virgin Mary (December 12th), I explained to them the story of why The Virgin Mary is seen as the Mother of Mexico and how she unified the natives and Spaniards under one – the Mexican people and why she is so celebrated and her image is everywhere in Mexico. Then I finished the class off with sharing with them a very popular and uplifting song from Superstar Cuban Singer- Celia Cruz – song- La Vida Es Un Carnaval – and translated the main part of the song of why it is such a great and uplifting song that inspires people to not let life get them down and to celebrate life no matter what. 4th week – The continuation of HHM with more show and tell items from las Tarahumaras, but this time the different clothes the Tarahumaras made. They made Mini Piñatas, and learned about Folklorico dancing. 5th week – The students explored and discussed the various senses in Spanish. 1st Grade: First grade is immersed in a variety of games and activities to complement their skills and challenge them to discover new ones! Occasionally we will play jump rope, hula hoop, or create obstacles to challenge our physical skill set. We have also been playing a variety of classic acting games which focus on turn taking, accepting new ideas, going with the flow, creative expression, and build a sense of family. Many songs have been sung as well and we are continuing to practice a few we hope we can show in the near future! 3/4th Grade: To compliment 3/4’s study of Florida the students will present a play that showcases the very very very early life of Florida’s first beginnings in addition to a play relevant to their more modern Florida stories. : The railroad, the circus, the citrus groves, etc. We hope to perform this before winter break. 5/6th Grade: This grade eagerly awaits their opportunity to put on a full play with stage and scripts and with all the responsibilities this totes. In preparation for this, we are working on Improv games and activities to enhance empathy, increase emotional awareness, and build the much needed focus and ensemble skills. Saltmeadow students have begun their studies in World Cultures with the fascinating country of South America. In addition to the history and geography of South America, they have explored the music, dance, mythology, poetry, animals, and food of the South American countries. They made a delicious chayote soup with Miss Yolanda. World Cultures studies are complemented by a Foundations in Social Justice course. Lively discussions regarding the Spanish Invasion, income inequality, and the environmental impacts of Western desire for South American resources have deepened the students’ understanding of the human experience in South America. Scientific studies are a hands-on experience at Saltmeadow! Our very first day included a water bottle rocket launch. The students made observations to determine the perfect timing and materials needed to get the highest and most satisfying launch. They are now studying thermal energy, which has included creating crystals and observing the conduction of heat. The language arts are being explored through literature, grammar studies, and creative writing. The students edit a silly sentence or paragraph as a daily practice for keeping grammar skills sharp. As part of both drama and creative writing, the students are creating their own radio drama in the style of War of the Worlds. The Saltmeadow newsletter, the Tortoise Times, continues to be student-run this year. The project manager is responsible for all aspects of making sure the Tortoise Times is complete and published on-time. The students continue to learn about journalistic integrity, formatting, and graphic arts. The Tortoise Times has expanded into a live newscast that the students are writing and filming themselves. Math is a rigorous experience, as we continue to solidify foundational math concepts while delving into new and more complex ideas. Our scouting program, the Navigators, is in full swing. The students have been hiking and geocaching at Oscar Scherer, Jelks Preserve, and other local wild areas. Observing and identifying the local plants and animals is a favorite component of the scouting program. The students continue with lessons in Guitar, French, Spanish, Yoga, Singing/Songwriting, Building Community through Entrepreneurship, and Human Relations and Sexuality. Human Relations includes a special focus on discovering the Self and our interconnectedness to all things. Artistic book work makes the studies more meaningful to the students.